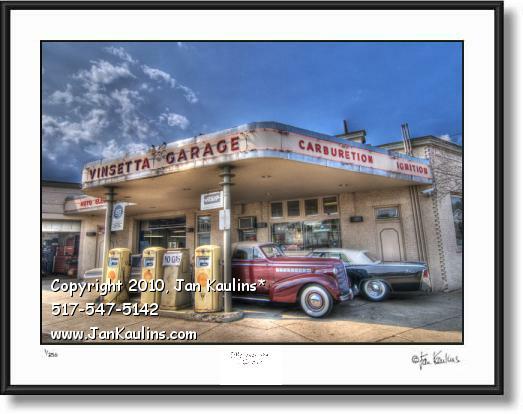 VINSETTA GARAGE PHOTO ART PRINT photograph for sale. VINSETTA GARAGE BERKLEY PHOTO PRINT PHOTOGRAPH ART for sale. For ordering title: VINSETTA GARAGE WITH CARS photo art prints photography photo for sale. This as a beautiful artistic multiple exposure Vinsetta Garage photo art print of this classic and historic Vinsetta Garage Woodward Avenue landmark, the Vinsetta Garage in Berkley photo. In front of this historic Berkley Vinsetta Garage building picture photo are three beautiful vintage vehicles making this an artistically created unique fine-art photo for sale only here on this website. Below is a bit of history from their website. "Circa 1919, on a two-track dirt road known as Woodward, Mike Kurta, Jr. rides his tri-cycle through his father's shop that services horse drawn carriages and is attached to the family's modest living quarters. By 1925 the building is moved back about 40 feet to allow for the widening and subsequent paving of Woodward Avenue. As one of the earliest drive thru service stations, business prospers with Mike Jr. and his wife Margaret eventually taking over the family establishment. 1989, while working for the Kurta's as a mechanic, Jack Marwil purchases the business. Jack is diligent in maintaining the architectural and professional integrity of the art deco garage. In fact, Vinsetta Garage becomes a Woodward Avenue landmark conveying the impression of permanence and stability. Today Vinsetta Garage boasts close to a century-long commitment to servicing motorists. Passing through the heavy wooden door is like a walk back to "the good ole days" where first names and a firm handshake were the order of the day. The customer service continues to be friendly, prompt and above all reliable today."